Twin Dragon Martial Arts is the only Authentic Traditional Hung Gar & Shaolin kung fu school in New Hampshire & Maine. 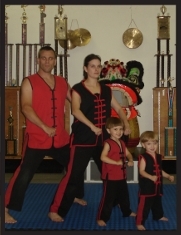 Twin Dragon Martial Arts specializes in teaching students of all ages and abilities. Our Instructors are Teachers licensed by the state and have more than 30 years experience in the Martial Arts. We offer classes for children, adults, and have a unique family style class. Sifu John Fillipon is the school's master instructor. He has obtained expertise in several martial arts during his 33+ years of experience in the martial arts and has traveled the world seeking those that would increase his skills. From New England to California and across the world to China he has devoted his life to the development of the Martial Arts and the betterment of his students. self-control and to use their kung fu knowledge properly. and helping those in need.